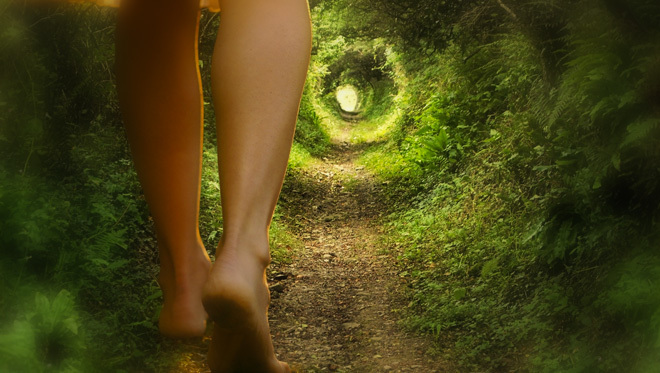 As I was approaching the bend in the path, I saw her, the most beautiful young woman I had ever seen. Not like the women of my youth. This one appeared a truly modern young woman. Her pale alabaster skin and green eyes shone against the depths of the forest she emerged from, which made her almost futuristic, I suppose. Such features! I hadn't seen her approach but I sensed her, although I swore I heard a twig snap. I wasn't afraid, not at all. Not even before I knew what or whose presence I felt. "Hello," I said as I faced her. "I'm lost." "Oh, you appear to be," she replied. "Well, you're not exactly dressed for a forest walk, in your stately attire and shiny black shoes - not exactly woodland walk material." "Yes, I suppose you're right. I'm not dressed for the occasion. I sort of wandered in. I'm on my way home from meeting The Elders, you know, and I wanted to be dressed for the occasion. Only now I find myself lost in a forest"
"Did you meet with anyone close?" "Do you know something, the only thing that I can remember is that it was important. That's funny. What's wrong with me? Why can't I remember?" "Ah don't worry, it will come back to you when you find your way. Walk with me and I will find you a clear path." 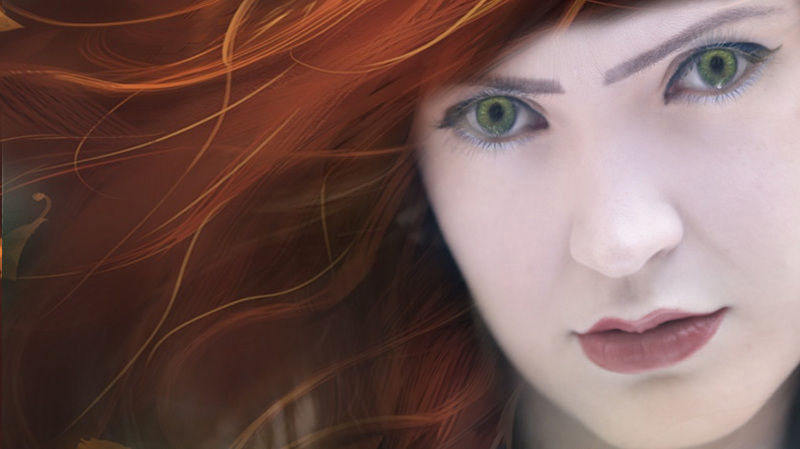 "My name is Willow, but I am known by people here as The Red Haired Woman of Dún a Rí." I laughed at this, although she looked quite serious. We fell into step together. I wanted to know everything about her. I wondered if she lived locally. Willow sighed. "I have been around here all my life." "That can't have been long! You're so young," I smiled. She smiled too. "Ah, youth is a state of mind. I have seen the leaves turn from green to gold. I have seen their abundance turn to bleakness. I have heard the wind turn from a whisper to a howl. And blankets of darkness fall from the skies at an hour which is yet young. I have seen the first carvings on "the kissing tree". I have seen beauty like no other, when the forest is transformed by whiteness, the mist and snow deep like a soft, comforting cloud. The trees with branches bowed down by their burden, which is not a burden at all but the richest of beauty welcomed by them. I have seen the beauty of God in Dún a Rí. The trees covered in green buds. The birds collecting twigs. Woodland creatures clambering to make new homes for their families. This is when Dún a Rí comes alive." "You remind me of my granddaughter," I said suddenly. "The same red hair and deep way of thinking. My fiery lass. May she rest in peace." "Oh, she's dead?" asked Willow "How did she die?" "It's a funny thing but I can't seem to remember. What's wrong with me today?" I was starting to panic. "Don't worry," said Willow. "Walk with me. We are on the right path now." It was then that chaos erupted. A frantic voice was calling, "Dad! Dad!" My daughter Rosie emerged from the trees, her face red and her eyes bulging. "Oh Dad," she said. "Thank God ... I've been looking for you for the past hour! Why did you wander off? I went to get petrol ... I was only gone a few minutes. What am I going to do with you?" "Oh stop fussing," I told her. "I just cut through the forest park for a walk. And I was in good company with this young lady." "What young lady?" asked Rosie. I turned around, but there was nobody there. Willow was gone. "Now look what you've done," I said. "You scared her off. I was lost and she put me on the right path. I wanted to thank her. How could you, Rosie? You're always fussing. I can't have any peace." I walked away from her. "Willow," I called. "Willow!" But there was no reply, just birdsong and the whisper of the wind. "My god," exclaimed Rosie. "Now you are imagining things. As if it's not bad enough that your memory is failing. And look at your feet. They're soaked ... and with your bad chest! I'm taking you to the Cabra Castle to dry you off and get you something warm to drink." "Nonsense! There is nothing wrong with me. I'm perfectly happy right here in the forest." "I don't care. We are going and that's that." When we entered the Castle Rosie had a whispered conversation with the concierge while the lady of the manor ushered me into a seat by the fire. The lady was tall and elegant and well dressed, with a remarkable streak of white through the centre of her black hair. She took a seat beside me. "I hear you had a nice walk in Dún a Rí" she said. "I had indeed." "Would you happen to know a young girl called Willow? - Lives locally. I was temporarily lost and she put me on the right path, and I want to thank her. Lovely girl with bright red hair an ..."
The concierge stopped abruptly as he approached the fire with hot drinks. "Oh my God, you saw the red haired woman," he said, staring at me wide eyed. "Do you know how privileged you are? She only shows herself to a chosen few." "What do you mean? Who is she?" I asked. "Ahh," said the lady of the manor clutching my arm now and smiling brightly, "She is the spirit of Dún a Rí. She's been around since Celtic times. She is the wildness, the beauty, the gentleness and the peace of that forest." "Ha! Are you suggesting I've just seen a ghost?! Are you mad? This girl is alive, young, vibrant and definitely not an ancient Celt. She's a modern young woman." "Oh, she often appears as someone you once knew. Sometimes young, sometimes not so young. She can also appear as a forest creature, such as a badger, fox, or hare. Sometimes she even appears as a Red Ghost, dressed in a soldier's uniform similar to those who use to occupy the old military barracks at Dún a Rí. But she always communicates in the voice of a woman". "How bizarre", I said. I pointed out that I wasn't scared, and that a ghost would definitely have scared me. "That's just it!" declared the lady of the manor. "No one ever claims to feel fear, no matter what form she appears in. She comes mostly to those who are troubled or have lost their way, and also to those who have been chosen for a special purpose in life. She is full of wisdom. She is all things to all people - as is Dún a Rí itself." I left the Castle in a daze that day. Could I really have seen a ghost? I don't believe in ghosts. But I believe in Willow. My health has deteriorated in the years since, and I am confined to this chair now. I can’t seem to remember how to walk but I have spoken and written much about my encounter with The Elders that day. But I have not uttered a single word about my experience at Dún a Rí, until today. The sun is warm now. I am walking again through the trees. I see her running towards me, hands outstretched. The beautiful Red Haired Woman of Dún a Rí. "Welcome," she says. "Welcome. And walk with me. I will show you the right path."